I don’t know whether my favorite room in our new house is the bathroom, or the kitchen – well, put that way, the kitchen wins – but it’s been such a pleasure to take a long warm shower in such a roomy space. A luxury that I often took for granted before our RV life! I’m spending a lot of time in the kitchen baking – I love to bake, (in the 70’s and 80’s I baked all of my own breads) and I love having my tools and a big oven again! I want to share this GF Carrot Muffin recipe with you, not because it’s inherently healthy, or even healthier, but because it’s a darn delicious recipe. And it had me scratching my head, then laughing at my dense-ness, over the directions! But, before I get to that, I want to chip in my two cents about GF cooking and the fact that going gluten-free isn’t healthier than eating gluten. Gluten isn’t some evil poisonous thing that’s been added to our food. Gluten is a protein found in flour, nothing more. It is this protein that grants things made with flour their elasticity, texture, rise, and exquisite flakiness. Only a small percentage (1-2%) of the population are truly gluten intolerant (celiac disease) while 6% are gluten-sensitive and, like me, plain old allergic to wheat. We must avoid it to be well and healthy. Switching to GF substitutes made of white rice flour, brown rice flour, potato starch, sorghum flour, etc. isn’t going to help if you’re switching hoping to lose weight: pizza, even a GF one, is still pizza. A cold-weather cozy: if you have access to Netflix, I highly, highly, highly recommend watching Michael Pollan’s fascinating four-part series, COOKED. The section entitled AIR is my fave… about bread. If you want to make a healthy change, try switching to organic breads, and using organic flour for your baking. I personally use King Arthur products (and, no, I’m not being given anything for saying that) and they have a wonderful website and a good GF flour blend. I’ve worked out, and adapted, some great GF recipes… for when I want a treat. I’m happy to have them, but they are no comparison to wheat flour… That said, this Carrot Muffin recipe from The Minimalist Baker (nothing minimal about this recipe, the ingredient list is a mile long, but worth it) is pretty darn close! I couldn’t wait to eat one, but they must cool completely or half the muffin sticks to the paper! And, GF tends to taste better after it’s cooled, honest. I store them for a couple of days in a big ziploc, then refrigerate or freeze. Let me know what you think! Life has been a whirlwind since my last post – we stopped in Austin for a couple days to handle some business, and it began to rain. (I’m sure you heard about the flooding here in Texas). 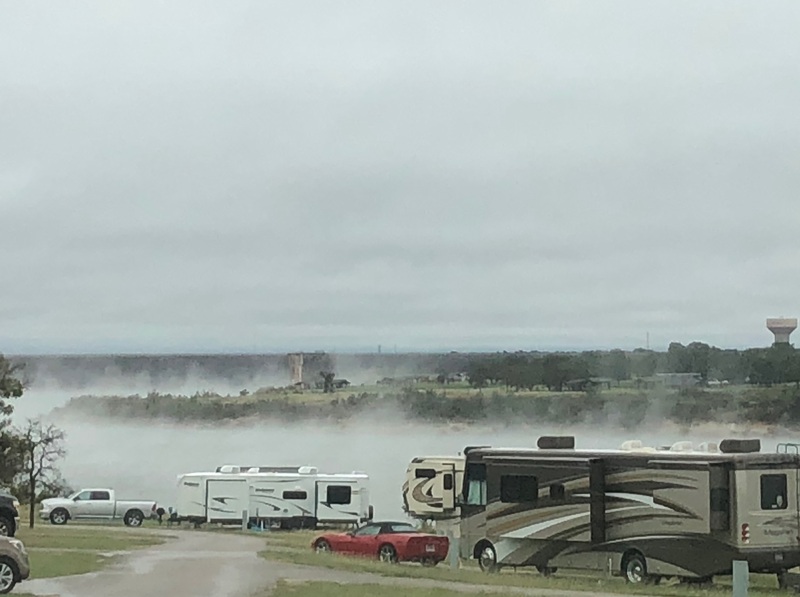 The lake we were camped beside rose dramatically overnight, and it was “colder than the dickens,” so we left and headed to Houston. Gratefully, they had space for us. It was warm, mostly sunny, and their pool was heated. It was fun, but we were so impatient to “laissez les bon temps rouler,” that we both woke at 5:00 a.m. the morning we left for New Orleans! The last time we drove through Louisiana, I-10 was in horrible condition. 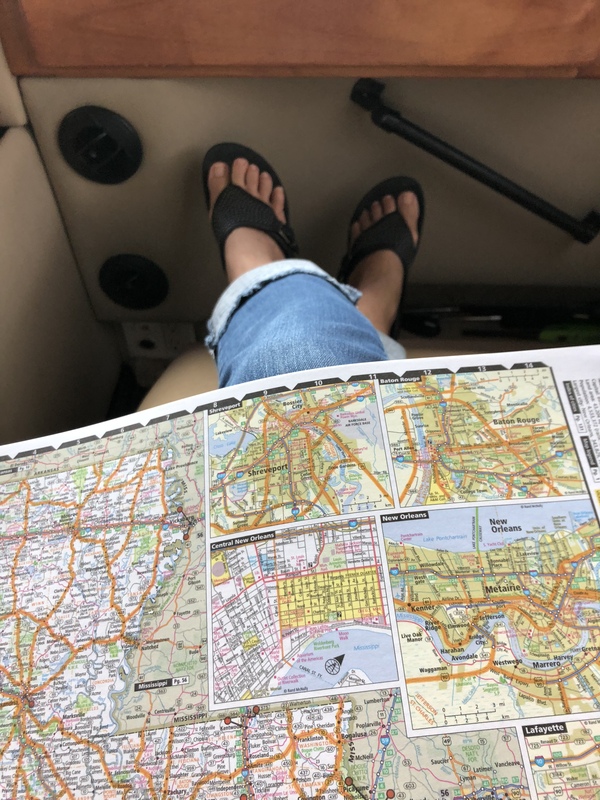 Looking for alternate routes, we followed the advice of another RVer, taking a road they said was better and more interesting. Ugh. It was even worse than I-10. But, it was more scenic! We drove past endless fields of sugarcane, a crop neither of us had seen before. We drove over too many bridges to count, and sailed past a sea of cattails (another thing neither of us had ever seen). 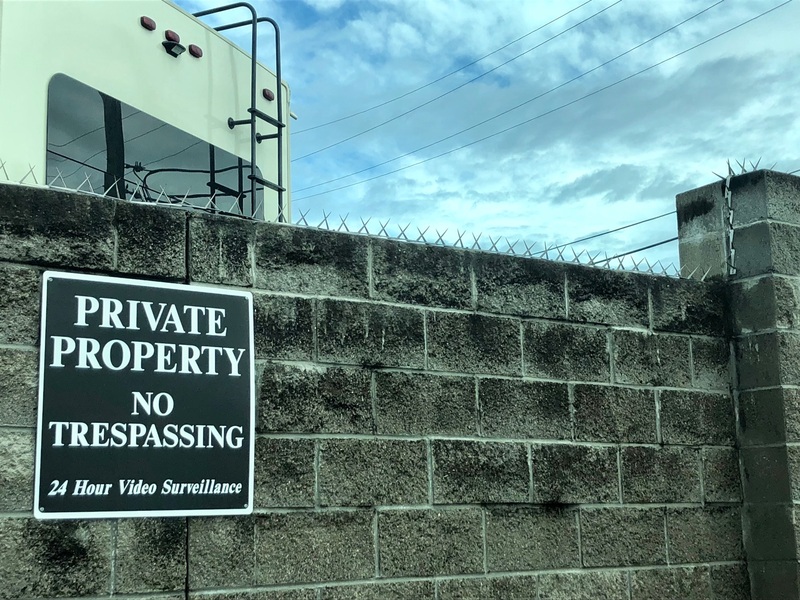 Finally, we crossed the enormous Mississippi River, curved around the Superdome, made an incredibly narrow, and gut-wrenching, turn and arriving at our “securely fenced” RV park in the French Quarter – right beside the oldest cemeteries in New Orleans. I couldn’t wait to go explore! We were meeting friends for dinner that night at 7:00 pm, and I was tasked with finding a place. 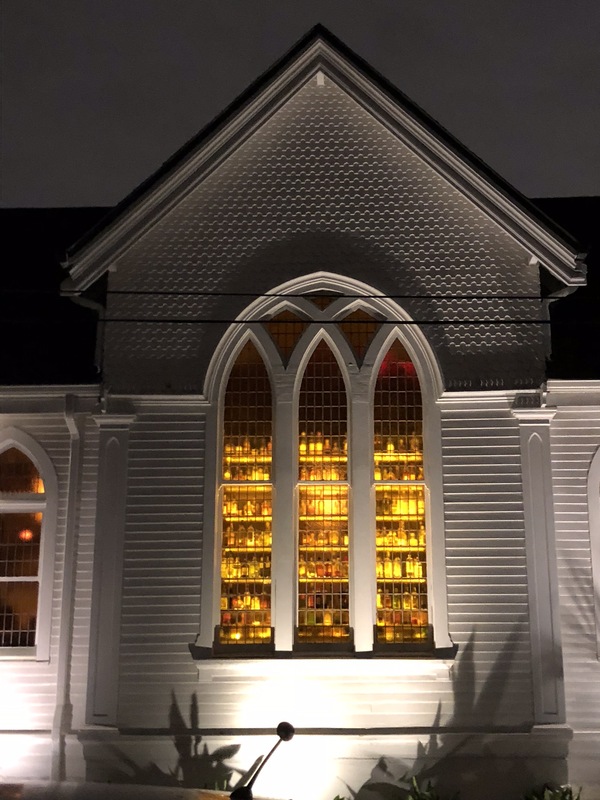 I chose a restaurant named Vessel, housed in a beautifully restored 1914 Lutheran church. The beams in the open-ceiling bring to mind an old ship, and bar reaches skyward in front of golden glass windows. The bottles residing on the top shelves are reached via library-ladder. Classic cocktails are their specialty, with an emphasis on the proper glass (vessel) and ice for each, and their food was delicious, fresh, beautifully presented, and affordably priced. Vessel lived up to all of our expectations! Early the next morning I dragged my sweetie out into the streets to head to Café du Monde for beignets since he’d never had one. 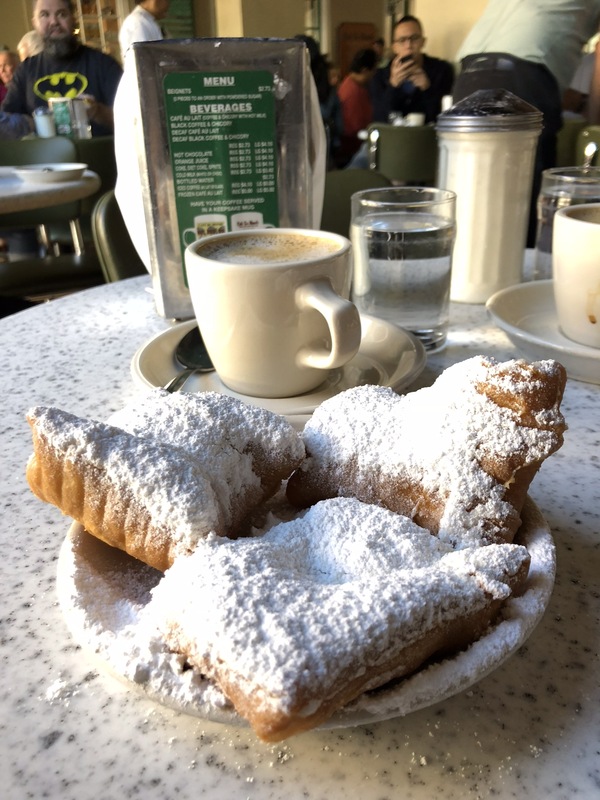 The walk was only 8 or 9 blocks, the sun was shining, and the St. Louis Cathedral Bells were chiming as we enjoyed our beignets and lattes. What a guilty pleasure! 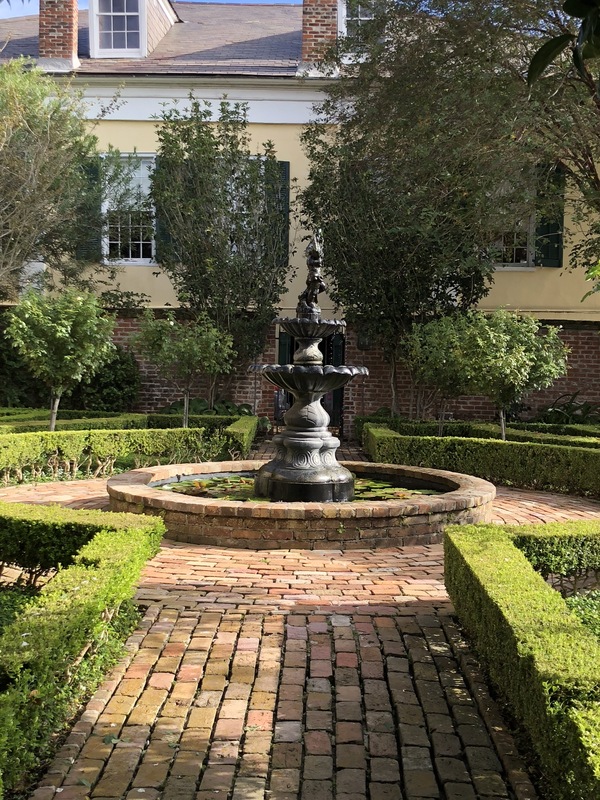 We strolled for a while before heading “home.” We were meeting Mike and Patricia for a late jazz brunch in the Garden District at Commander’s Palace, an elegant old mansion that’s been operating since 1880. I appreciated that there was a dress code: no jeans or shorts, men needed a jacket. 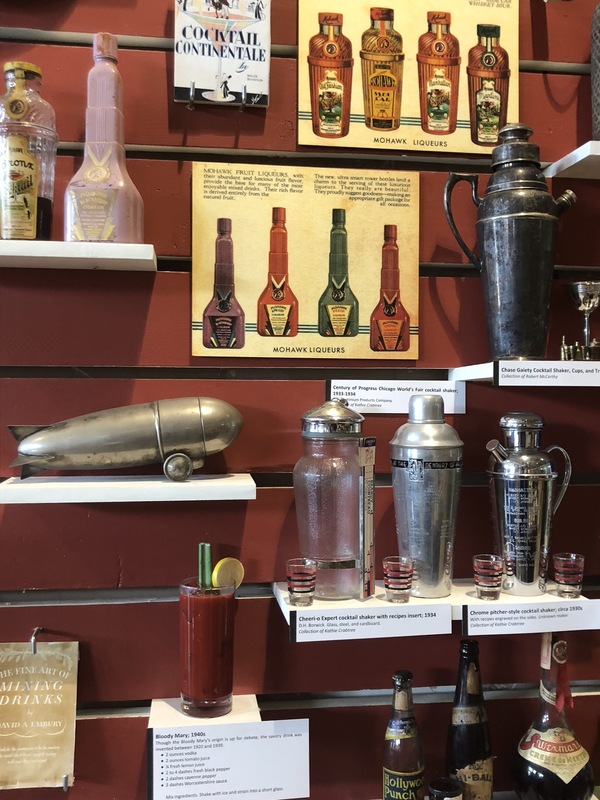 What a pleasure… everyone looked great and “acted right!” I’ve been thinking about their Ramos Gin Fizz every day since! The mansions there were so grand, that the next day we hopped onto the streetcar and rode all the way through the incredible Garden District. However, the return trip was so claustrophobic, that thinking we were closer, I insisted we get off and walk home. It turned out to be a 2.2 mile walk! We missed lunch, but grabbed some lattes-to-go and hustled in order to meet our friends on time for cocktails at The Roosevelt Hotel, they were both looking forward to having a Sazerac, since it was invented there. Afterward we strolled down Canal Street to the Palace Café for a light supper. After lunch we strolled the large open museum, seeing many items we remembered our parents, and grandparents using as we grew up. There were also many items we knew nothing about. As we perused, we listened to a tour group in an open classroom. 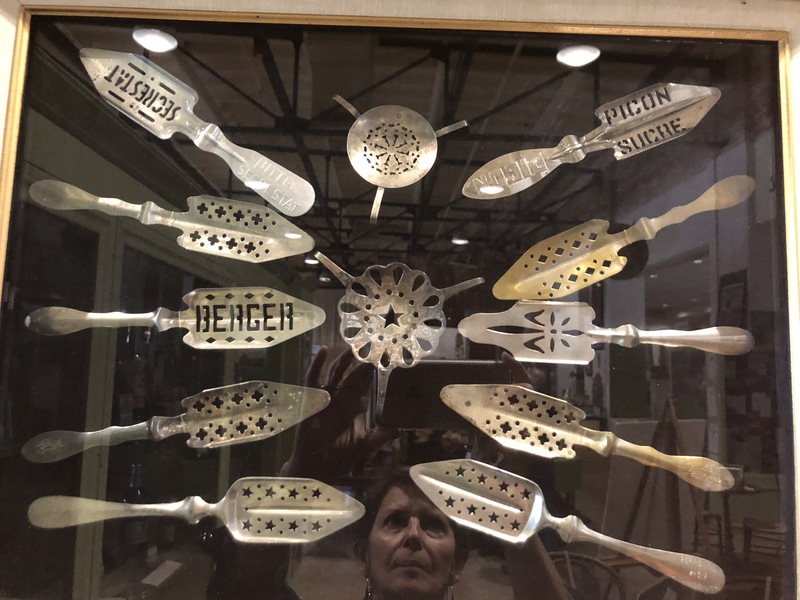 They came in for a private class on Absinthe, and every one had a glass of the pale green liquid in front of them… silver sugar-cube spoons (above) and all. The day we were supposed to leave it was windy and raining hard in the morning, so we asked to stay an extra day. Luckily, the weather cleared, and we walked to Acme Oyster Bar for lunch (personally, I wouldn’t go again). On the walk home we finally had both the time, and an unlocked gate, to stroll through the St. Louis 2 Cemetery. There are three Roman Catholic cemeteries, built in 1789, 1823, and 1854 respectively. 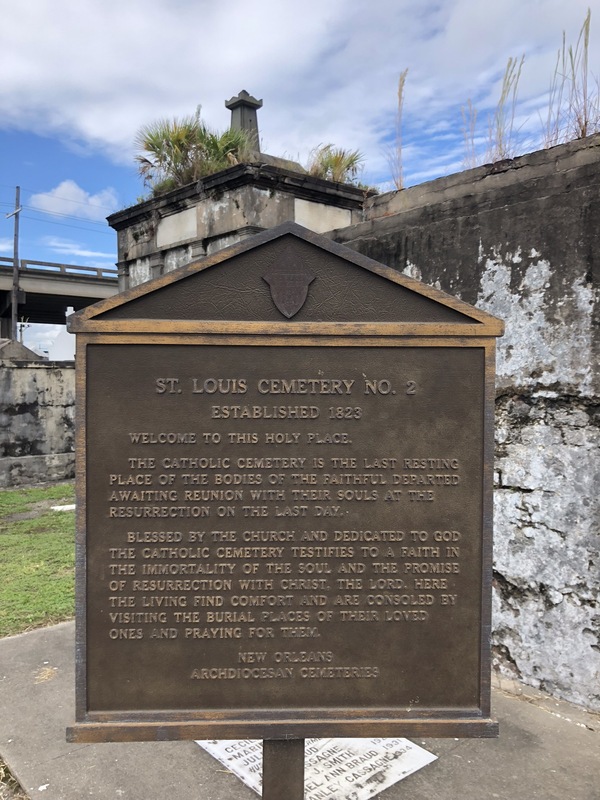 The graves are above ground in New Orleans because of the high water table, and the fact that in places, New Orleans is below sea-level. 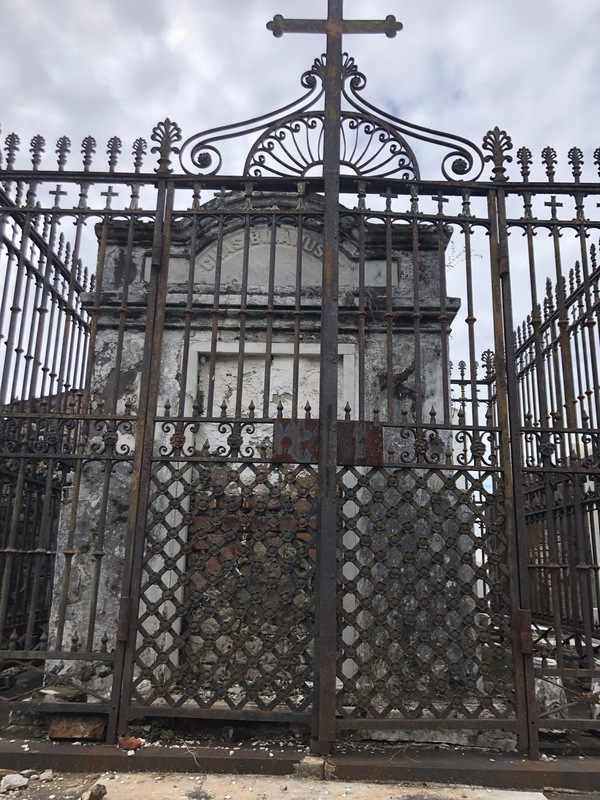 Many have nobody left to attend to them, and are in various stages of disrepair, but a group is currently working to restore “abandoned tombs” in St. Louis 1 & 2. It was beautiful, sad, and inspiring to think about the courage of these people who braved the journey, leaving so much behind them, to settle in a new territory so completely different and begin the process of that would create this unique and historical city. I loved New Orleans.